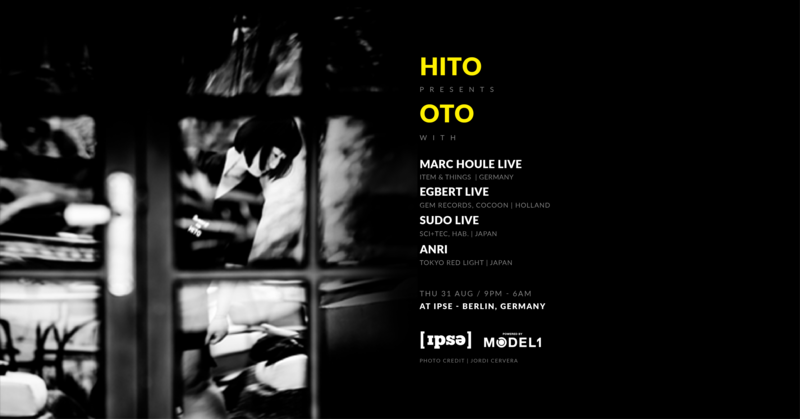 Japanese born Berlin based Techno DJ HITO launches her curated event series at IPSE Berlin starting August 31. Named OTO, Japanese for ‘Sound’. HITO sees music as a way to unite through creating and sharing Techno in a pure and organic way, and performing as a way to manipulate energy and bring the crowd and DJs together. She promises an atmosphere that only occurs when friends and family gather together to share their creativity under one roof. HITO moved to Berlin from Himeji, a traditional city of Japan known for its symbolic Himeji Castle. In Berlin she felt welcomed and inspired to develop her music alongside the characters and friends she spent time with while enjoying being a local Berlin DJ. Now 18 years later she feels ready to present her own offering to the town she calls home. HITO will invite a mix of upcoming and established DJ friends and associates from Japan, Germany and the rest of the world, merging cultures between musically associated people. Each line up is designed to demonstrate the talent she recognises on her travels as well as big name surprise guests as a an occasional surprise for her audience. All artists will play on the PLAYdifferently MODEL 1 mixer by Richie Hawtin and Andy Rigby-Jones, of which HITO is an ambassador. She loves to introduce the instrument to new artists and enjoys sharing the unbeatable sound quality with her peers and the crowd.